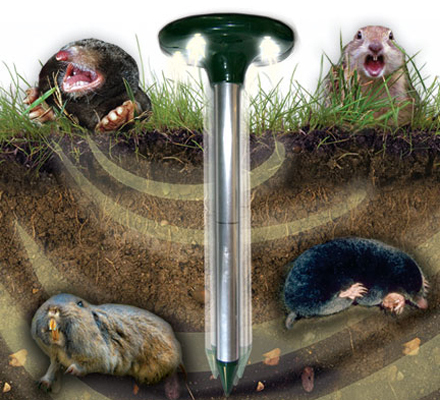 The Transonic Mole shakes, flashes, and buzzes to provide an effecive deterrent against burrowing pests including moles, gophers and Richardson Ground Squirrels. Its sensory assault is triggered by the built-in timer (default delay is every 20 seconds). 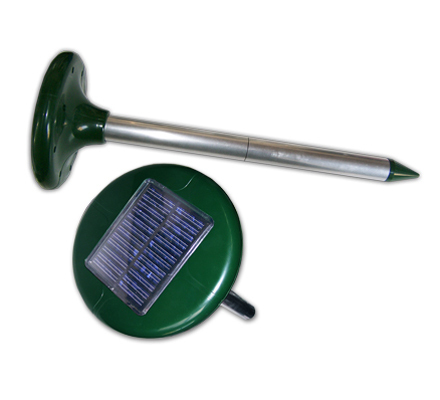 It runs for days off the built-in rechargeable battery and solar panel, and has an effective radius of 50 feet (i.e. 7,800 square foot area). 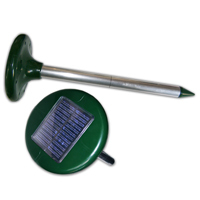 Clean, safe, non-toxic, harmless to pets and humans, this solar-powered unit emits bursts of sound and vibration every 20 seconds - and light flashes every 5 seconds. The sound waves and vibration penetrate the burrows and surrounding soil, irritating the sensitive perceptions of underground visitors- while the flashes frighten and disorient any sighted pests above ground.